First, to start with some positive news! 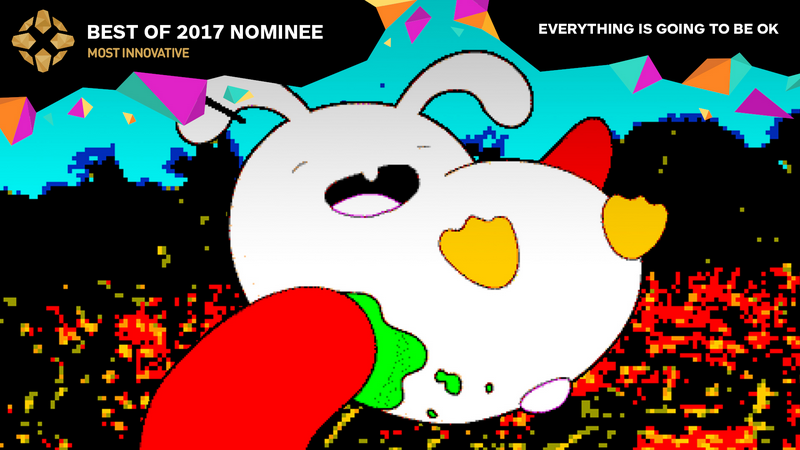 IGN has nominated “Everything is going to be OK” for the Best of 2017 under the most innovative category! This is tremendous and I so hope some of this (in whatever small amount) sets a stage for how other games like this will be viewed. I really hope these types of experimental games start getting the respect and recognition they deserve. It’s legitimate art that deserves a voice. It sounds so crazy saying something like this in 2017 because I thought we where long past it, but there’s so much more that can still be done. I’m hopeful and excited! Also, WIRED has a wonderful article written about “Everything is going to be OK” too. I recently announced that I’m building more into “Everything is going to be OK”. The project will receive an update with new “pages” in it. Since announcing it in this really lengthy philosophical post, I have fleshed out a much better direction for it! I’m excited. It’s shaping up well. One thing that captivated me about zines was the totally personal writing in them. Profound, personal, poetic, etc… how a lot of them are largely focused on writing and presenting that writing in an unusual manner. Such as collages. For me to be able to call “Everything is going to be OK” an interactive zine, I feel like it needs a lot more of that (personal writing). Right now most of the focus has been on cute characters (cartoons and animation), and the writing is too much of an afterthought. I feel like it could go in the “zine” direction much more profoundly. This feels like what was missing. Granted there is poetry, but you have to find that. The personal writing part is still very ambiguous. For this new set it’s going to be the other way around. The writing will be at the forefront. They’ll be broken up into parts, and you explore each essay in a very different manner. They’ll be available in the main menu, just like all the other pages, but with slightly different icons to set them apart. I’m not afraid of this coming off as a “bad live journal” (as some comments have pointed out about the poetry, but who reads in a game anyway). I find it interesting that personal writing gets dismissed that quickly. 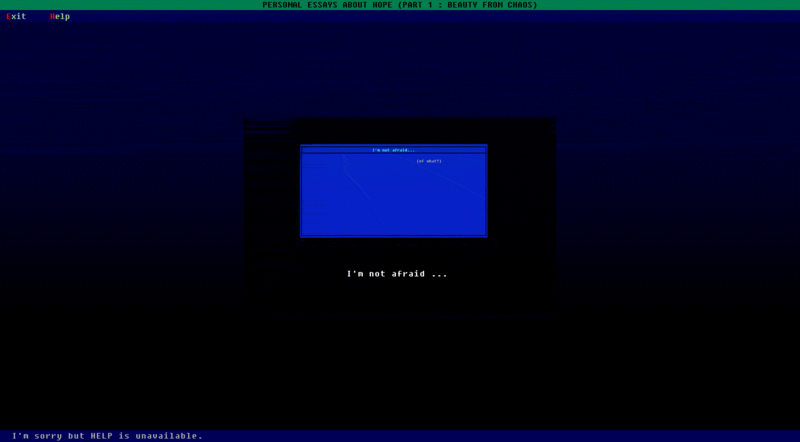 Vulnerability is taken strangely when it’s in the “video game” format. Good grief, I could make a game out of making this type of game. I don’t see anything wrong with being brushed off as a live journal. Honestly, I don’t see how that’s a bad thing. We strive so hard to have authentic writing in games. Life is Strange could just as easily be a bad live journal. I don’t think it is, but you could say the same. Holding vulnerability, and emotion, at a comfortable distance is kind of a disservice to any creative medium. So I won’t even worry about that at this point. That’s basically what zines (and other formats focused on personal writing) are. So I’ll pursue that personal touch even more. I realize all the risks involved by going in that direction, but I think sharing very personal things takes courage and is something to be proud of doing. I don’t like how afraid of doing that, or consuming that type of content, we often are. It puzzles me, so it’s worth exploring. I’ll probably have a lot of interesting observations to share after this. This update is going to be a good space for poetry, and sharing philosophy, and that’s what I find exciting. What I also find exciting about this idea is that I can explore all sorts of interesting ways of presenting writing, and abstract thoughts. 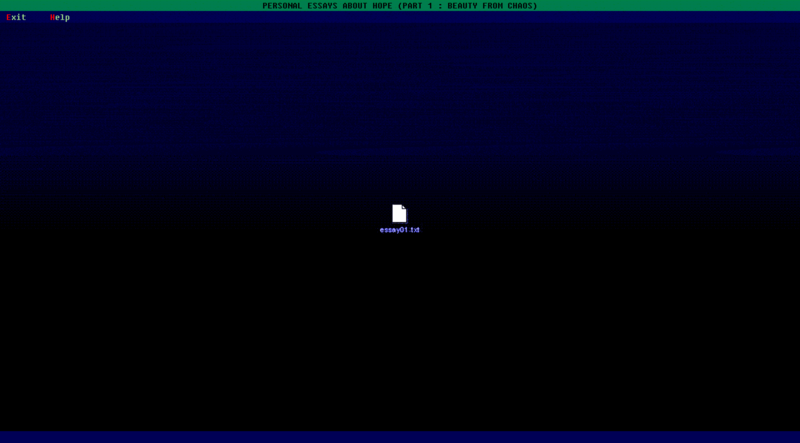 The current one I’m working on is an old computer system, and you kind of “move” through it, uncovering the writing as you go. Some of it will be linear, but I want it to have many dimensions. Topics will be uncomfortably personal for me, but that’s the point of this entire update. This new release is going to be all about that. I find this terrifying for the million reasons that I’ve already talked about, but it has that appeal of working against taboos about what you can and can’t share. This is what I’m drawn to. I’m going to go full into that direction. No metaphors. Completely based in what happened. Discuss sexual assault, poverty, suicide… Things you can’t talk about because we just don’t. This will be done in a constructive hopeful manner. Philosophy, and lessons learned. Just honest and human. I love that I’m afraid of it. At the same time I just know that this is opening me up to all sorts of crap. I’m not looking forward to that, but I feel like this is all very important. I’m not making this for these types of people. I’m making this for people it will resonate with. Maybe I fret too much about this, and I should just take it all on the chin. Whatever, everything is a work in progress. I feel like, on some level or another, this approach has the potential of encouraging discussion about these topics. That’s been one of the primary goals of the entire “game”. “Everything is going to be OK” is supposed to be a personal work, and a zine, so I should stay respectfully true to this format. These comments (old reactions from people) where also to a personal project (net-art, very old, had a cult following). My conclusion is that things have not changed that much. I don’t see it. Maybe I’m still too close to this and not able to make a rational assessment, but it has definitely led to some interesting observations and discussions. people will often look at your work through the lens of current trends. I feel like if anything, going through all this juts to realize this again was worth it. I’ve so been down this road before with my older work. People’s views of different, unique, or never before seen work, are often tainted by the lens of current trends of the time that they are viewed through. A creator can very much be too ahead of their time. That’s not necessarily a good or easy thing to be. If that is said of a person, then chances are they are appropriately ahead of a current trend, but not really ahead of their time. Really being ahead is bad and misunderstood. Being unique can cost a lot. Different things are often held back by the context of the time in which they are created… At any rate, food for thought. I’ll be thinking about this more. A handful of people have mentioned that they are concerned for my mental state, sanity, and generally that this “game” may be a reflection of my mental state. I’ve never been sure how to respond to that. I’ve gotten that frequently over the years, but these seemed to be more pointed. 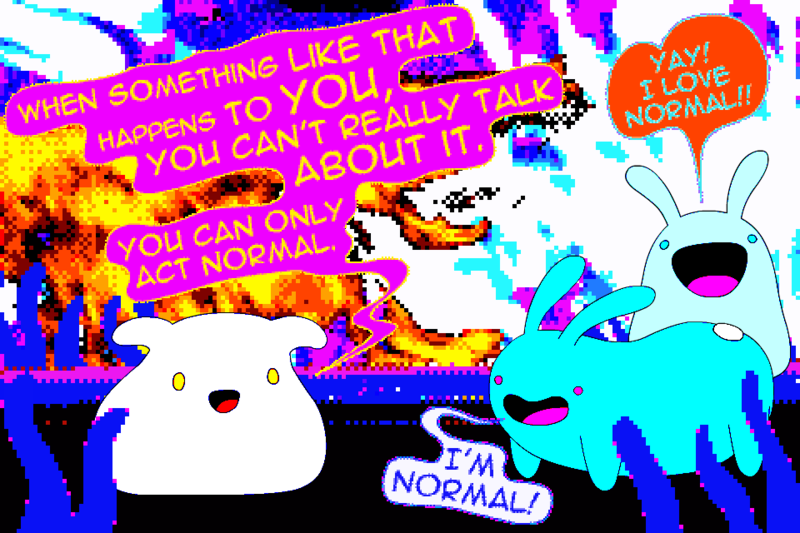 Most of it came off as trolling, but it reminded me a lot of older comments to that much older net-art piece that I created. This older project was also about struggle and survival (mostly war and poverty). So it’s interesting… if you discuss these topics, from a personal point, people might not really be ready to open themselves up to hearing these stories. It drives me crazy sometimes. Is it really ok to witness war (or other hardships) from behind a gun, you being the one shooting, but it’s not ok to experience that all from the point of view of the victim? Power in entertainment is such a strange double standard. On one side we want art and human experiences, but on the other they have to be fitting entertainment. Consuming this (alternative, rolls reversed) type of “entertainment” is uncomfortable, so it causes a lot of charged reactions. When they are positive, they are REALLY touching and positive. When negative, it can get pretty intense. Coming at the artist from a point of superiority (there must be something wrong with your head) is one reaction. It’s a bit like the viewer is guarding themselves from these topics by having to say something smart. I understand genuine concern, I’m not discussing that. It’s just that over-associating the artist with this type of work has always puzzled me. I feel like, when you create a game (or any other art) to talk about personal things, social issues, or just about any topic that is problematic, the stage (mood, tone, setting, framework) you create to do so is the space that you are willing to share in. That is your framework for consensually talking about these topics. So, when someone approaches me outside of that, and starts asking questions along the lines of if my brain is ok, I’ve always found that incredibly intrusive. It’s an interesting reaction on my part as well. I really don’t want to answer, and I’m never ready with an intelligent one. Surprisingly enough “Everything is going to be OK” didn’t get this as much until more recently. I would have expected it to happen sooner, but it’s quite a bit now. I think this is probably because the project has started drawing in more attention. It’s very much wandered outside of the comfortable sphere of the supportive indie alt-game bubble. Funny how people that understand art totally love it. Open mindedness matters. More mainstream audiences get kinda crazy polarized. I don’t know… Just more observations about that, which are probably worth being aware of if you are doing something similar. Also, this is a very good Tweet.